The BnW Christmas Collection blog hop is here!!! Welcome to our BnW Christmas Collection blog hop! 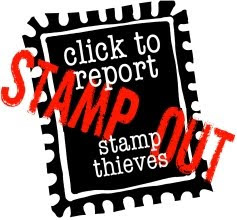 I am sure you are going to fall in love with these new stamps that Summer has in store for you. Elisabeth has once again (don't know how you do it sweetie) created stunning images that really warms your heart. Nov 4th (by me -since it's my b'day:-) and Nov 5th by Susan (since it's her b'day;-). So what do we want you to do? We want you to complete the full blog-hop and also leave comments on each blog and the BnW blog where you also need to answer a question. 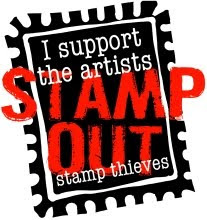 Also - a very IMPORTANT note - the stamps will begin selling on Saturday Oct 31st!!! YEAH! So - what can I show you today? Well - I got to display these two cuties eating Gingerbread and of course the stamp is called Gingerbread Love. Aren't they just adorable? I immediately thought of Isac and his cousin Julia. This is how I picture them together when they are a little bit older - sharing and having fun together. I coloured them with my copics and highlighted the gingerbread with my cinnamon stickle. I hope you like it and of course there's a recipe for making Swedish Gingerbread. We normally bake ours just before the first of Advent together with our Lucia buns. We also have a saying in Swedish: If you eat many gingerbread cakes - then you become a very kind and sweet person. Here's the recipe of Swedish Gingerbread. Heat up the sugar, syrup and the water in a pan. Put the butter and the spices in a bowl. Poor the hot sugermix over the spices and stir until the butter has melted. Mix the bicarbonate with almost all of the flour. Mix everything together and put the dough in the fridge until the next day. Cover it first with plastic wrap. Put them on the baking plate (make sure that it's not warm) covered with baking paper. Bake the cakes in the middle of the oven in 200-225 C approx 5-8 minutes. Let the cakes cool and then they are ready to eat! In Sweden we have them together with our tea/coffee, but also together with our hot wine punch. Also - you can serve them as an aperitif with blue cheese on them - that's a really yummy combination! Keep them in a tin - then they normally hold up to 2-3 months. Click on the above pic and it will take you directly to Jodi's blog. and that's the name for this weeks Try it out Tuesday set by our sweet Suzanne. I decided to make a fun and easy gift bag. I love doing these - but it was such a long time since I actually did one. It's so nice to be able to make a gift bag out of one sheet of paper - don't you agree. I got the tutorial a long time ago from Angie Juda - you find it here. Still loving it. Then I added heart eylets in silver and closed the gift bag with some blue ribbon that I found in my stash. I coloured Winter from the VC Winter Wonderland release with my copics. Added some Polar White flower soft on her coat. I must say - I really love the effect that the Polar White gives your project. It really looks like the real thing. 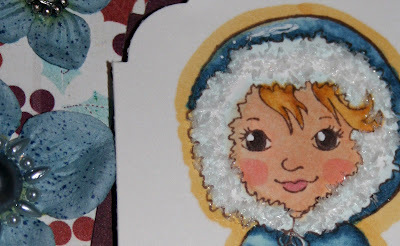 Then I used 3d gloss and sprinkled Sparkly fluff (Baby boy blue) on the ground to highlight the snow. I used smooch to highlight the hearts on her shoes and the hearts on the puppy scarf. Well - I hope this inspired you to try to make this gift bag and also - how to use some of your metal products at home. Have a great week and make sure that you check the rest of the DT creations. I am sure I will! Mom to be blogging these days. He is much better now, but have to take his medicine 3 times a day for the rest of the week. Anyway - I just wanted to give you heads up for some more fun heading your way this week over at BnW. If you check the DTs blogs this week - then you will be able to read and maybe see some bits and parts of the new BnW release coming your way. So just a small hint - check out Lynda's blog today. 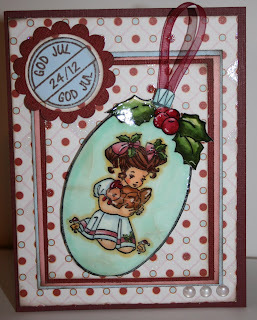 Welcome to the Lockhart blog hop featuring the perfect holiday stamps for your projects. Yes - it's getting closer to the holidays - can you hear the Angels singing already? Well - I can...after using this cute little stamp. And I hope that you all know that Susana carries the Lockhart images in her store. 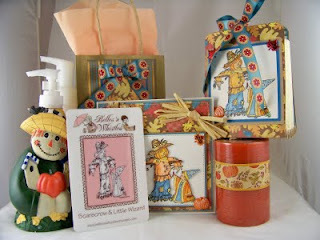 The team want to show you holiday projects/cards featuring the Lockhart stamps. 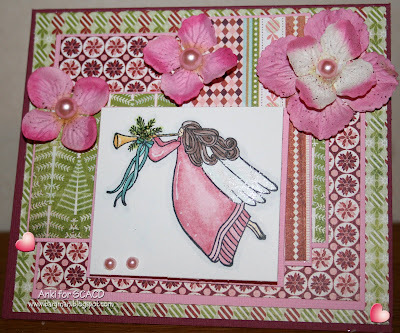 If you join us for the hop - then you can win the wonderful prize of 2 handsigned and coloured (by Karen) Lockhart stamps together with a white sparkle fluff, gold inspiration paint and a vintage X-mas flower soft! How does that sound? For all details - please check out our store blog. What do we want you to do then? Well - finish the hop, count the hearts that are hidden in each and one of our projects, leave a comment on the store blog with the accurate total of hearts that you've found. 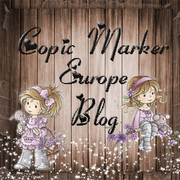 I coloured the image with my copics, used my Eskimo Kisses DPs - don't know how I could live without them before...hihi....Added my new Country Elegance flowers with a pearl in the center. Hope you like it. Would love to hear from you before you hop along over to Carolyn. Kramis and good luck with counting the hearts. over at our BnW Blog. The winner will be selected on Sunday - October 25th. Pop over and read all about it. It's time for another Try it out Tuesday. This time Suzanne wants us to show something for our tables - it could be place setting cards, menus, favors, centerpieces......Well - it's all up to your imagination. I decided to ink up one of my very first illustrations - Alicia. When I first drew her I only pictured her wearing red. Well - after having the Eskimo Kisses DPs - I've changed my mind. I think she look good in all colours :-) I hope you agree with me. So for my project I decided to create a little something for a girly-party. So I stamped Alicia 3 times and coloured her in the Eskimo Kisses colours with my copics. First of course I needed to make a little card for the party invitation. So here you have her. I added 3d gloss on some parts of the images, Polar White flowersoft on her coat, smooch on her little lantern. Added ribbon from stash and the Eskimo Kisses buttons. 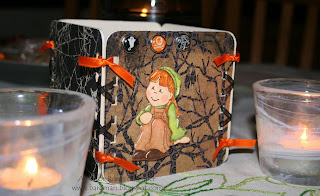 Then I made a tag/or a water bottle holder - the tutorial is from Angie Juda a long time ago. I did not have any chocolate at home to attach behind Alicia - but that's what you could do as an extra treat. I also punched out some snowflakes and added a Bella Bauble in the center. As a small favor I created this little notepad. Used my coasters (that I've ordered from Angie Juda) and covered them with the DP, sanded the edges and then attached the ribbon, the post-it-notes, snowflake and Alicia. This is just a little something for the guest to bring with her home as a small memory of the party. Well - I hope you like this and make sure that you check out the rest of the DTs creations. Happy Monday to you all! Hope you had a great weekend. We def. did. We got to spend a lot of time outdoors in the crisp, fresh and cold Autumn air. This time it's our supertalented Iris who has set the challenge over at our RoP/BnW site. 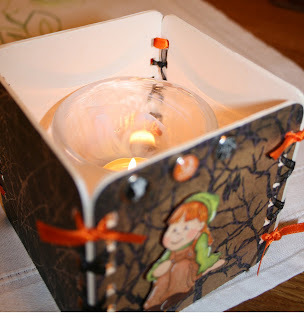 We should create something for Halloween - card, invitation or treat bag . Well - I have always wanted to make one of these coaster boxes - and this time I decided to do one. Punched the wholes with my bind-it-all, tied the 4 pieces together with ribbon from my stash. Glued the 5th coaster to the 4 sides and there I had the bottom of the box. Coloured the image of Sitting Mimosa with my copics and cut her out. Wanted to show you that you can use a stamp that is not typical Halloween and still create the feeling of it - by using the DPs as the background scene. Added a couple of scary brads ;-) from Basic Grey. I just put a little candle in the center - and then you can use it as the decoration for your Halloween party - or you can fill it with tons of candy. The choice is yours. Well - hope you like it and want to play with us. Kram and make sure that you check the rest of the DTs creations. Time to display another of the cute images from the Victoria Case Winter release over at SCACD. This stamp is called SKATER. Stamped her with Memento Rich Cocoa and coloured her with my copics. Had to use my Basic Grey Eskimo Kisses DPs of course ;-) Love, love, love them - as you already know...hihi..... Wanted to keep a rather clean layout. 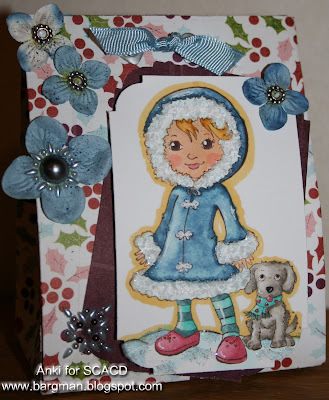 Added ribbon from stash, buttons from the Eskimo Kisses range. Twirled some of the left overs from the DPs and attached under the bow and button on the corner. Then I needed to create some snowflakes for her - so I made small dots and sprinkled the Polar White Flower soft on them - hope you can tell. We would like to show you anyting BUT a card. I got to display the supercute little Elf with heart - called Kringlet. So of course I thought of something to do for X-mas. So here's the result! I stamped her with Memento Rich Cocoa. Coloured her with my copics. Added some stickles. Cut her out and two other ovals with my nesties. Punched out some snowflakes with my punch and sprinkled them with Polar White Flowersoft. Added buttons from the Eskimo Kisses range in the center. Ribbon from my stash. Sentiment from Prickiform -saying in Swedish: From us all to all of you - A Very Merry X-mas and Happy New Year! Punched holes for the ribbon and added 2 eylets. Closed the box with a ribbon from my stash.See the below pic of the back of the box. Hope you like it and now - hop over to Dianne's blog to see what she's been up to. Victoria Case Winter Wonderland Release and Blog Candy! Just a quick update - don't want you to miss the release of Victoria Case Winter Wonderland for SCACD? The stamps will be available for purchase on Friday morning--October 16th! 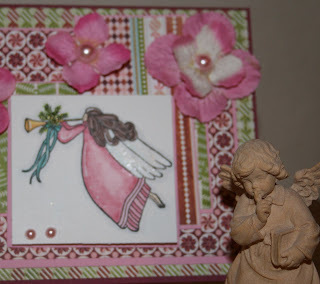 We will have a fun BLOG HOP for you this Thursday showcasing all the images. Susana is therefore also offering a yummy candy. Please pop over to the store blog to read all the details on what you can win and how ;-). Winner will be announced at 11:15 pm EST on Thursday night (Oct. 15th)!! Please click on the below pic and it will take you directly to the blog candy. Hope you've had a great weekend. Ours was great - since Isac finally is back to normal. So we tried to spend a little time outdoors - had to get some air after being stuck in the house for several days. I also managed to create this card for a friend of mine. She and her family was attending a b'day party for her brother-in-law. He turned 40! I keep saying it - but Charlie Bond is the perfect guy for cards to "older boys" (well - you all know this - they are still boys even if they turn 40...hihi.....) - don't you agree? Wanted to keep a clean layout - as I tend to do these days. Used my DPs from SU. Chalked with pine cone around the edges. Coloured Charlie with my copics. Added a few buttons and blings + 40 cut out with my QK Eliza alphabet. Even managed to do the inside of the card...*lol*. Not that often that happens due to lack of time. Sentiment from Aud Design. Love reading your comments and so sorry if I have not been able to pop by your blogs. Hope that everyone will stay healthy this week - so that I can get some blog-hopping time. Just a quick reminder from me. If you have missed it - we have a new Guest Design Team Member Call for the adorable Belles 'n Whistles! There are 3 positions up for grabs for the term of November through December. It's open to crafters worldwide! Check out the conditions and how to apply here. You have until October 19th to participate in this exciting call! First of all - thank you so much for your concern about Isac. He is now much better - the fever is gone. So I went with one of the the stamps from Bildmålarna - Mimosa Tea. Well - I drink tea - but prefer coffee - so that's why she's serving coffee for me :-) Also - my Grandmother (on my Father's side) and I was very close. We used to watch the sports together on Saturdays and drinking afternoon coffee and eating a lot of her yummy cakes. So sweet Mimosa got some grey hair. I coloured her with my copics, added 3d gloss on the cup and pot. Some stickles in her hair and on her trousers. Cut out the circles with my nesties and added the lace behind the brown one. Finally I added some flowers and drops from my stash. Have a great weekend and Happy B'day Marlene! Hope you will have a great day! or should I say - a little girl = en liten tjej in Swedish. trying to be layered as a small star. DPs are from SU, ribbon, roses and that teddybear charm from my stash. Added a couple of Baubles as well. 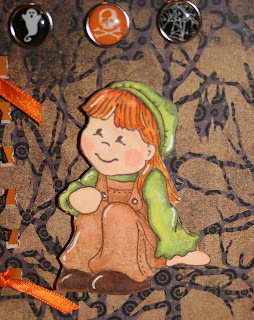 The cute little girl is Susy - from the SCACD Heart and Hugs release no2. Oh - and yes - she's coloured with copics of course ;-) Sentiment from Aud Design. Sorry for this short post today - but I am home with Isac who has a cold, fever and terrible cough. It's Tuesday again and that means a new challenge from our talented DT guru - Suzanne! Here you have her dressed in the Fall colours. Used DPs from my stash and my new leaf punch - loving it :-). Sentiment is a Susanament. Here you have a card saying Merry X-mas in Swedish (sentiment from Aud design). technique cracked glass. Have never done that before - but it was a lot of fun. Not sure if you can tell from the pic though. Used DPs from my stash and added a ribbon. 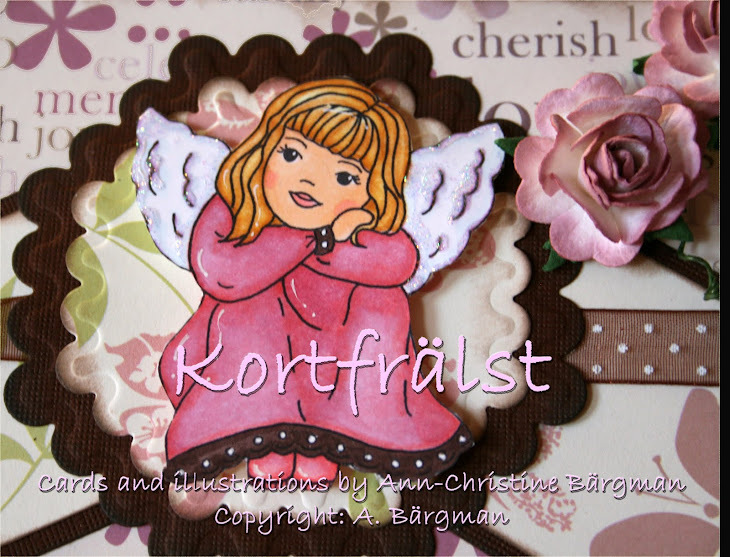 Well - I hope you like my projects and get the inspiration to use these adorable images in many, many different ways. So you see - 1 stamp can be used for 4 seasons ;-) Have a great week and check out the rest of the DTs cards/projects. Well - if you want to see the sketch that I was using - pop over to our BnW blog. Also - please make sure that you check our RoP/BnW Challenge blog to see what the rest of the DT girls have been up to. Kram and hope you will have fun! And who would love to have a piece of that yummy pie??? Well - I would. The weather has been really awful here in Sweden this weekend - it's November weather - meaning rain, rain and rain. So I would only want to stay indoors and of course - a slice of that pie would be great. Don't you just love this image? They are so cute together. I coloured "Mmm....yes please" with my copics - trying to keep the same colours as in the DPs - Eskimo Kisses (love, love, love those yummy papers). Kept the layout rather clean. Chalked the edges with pine cone. Added the buttons from Eskimo kisses and snow flakes cut out with my punch. Well - that's it. Hope to see you back here tomorrow - because then we have some new fun for you for our RoP/BnW challenge and also on the BnW blog. Kram and have a great Sunday! Just wanted to share a quick post with you today. I made this milk cartoon container for a friend of mine - they are going to a party this evening and she wanted something new to hold the chocolates that they are bringing. The tutorial is from Becky. You've seen me doing this one earlier - but then it was covered almost with all of the Anki's Sweethearts images. This time I went for the style instead of the cute factor. So here you have it! DPs from my stash, ribbon from Prickiform, stamps from SU. 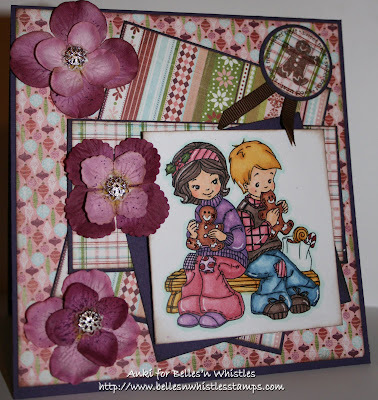 As you all have noticed - this weeks TIOT is a Try it out Friday instead - due to our mini-release of the wonderful creations of Elisabeth Bell and Victoria Case for SCACD. Suzanne wanted us to create a Halloween or Fall card. Well - we don't celebrate Halloween in Sweden (well - some have started to do so - just because the shops want to sell stuff ;-) - so I decided to make a b'day card using Fall colours. I stamped the adorable Milla using my Memento Tuxedo Black - that I think is the best when you want to colour with your Copics. Then I went for a rather "clean" layout using my DPs from stach. I also cut two laces with my Martha Stewart punches. Added some Baubles and matching Petaloo Dazzlers. The sentiment is from Aud Design and it's saying Happy B'day in Swedish. Wish you all a wonderful day and I am looking fwd to read your comments. Also - don't miss the rest of the DTs creations for you to be inspired by.